Materials List. Then cut the Va"-thick plywood bottom to size. 2 Using dimensions on Drawing 3, locate the centerpoint for the radius on the footboard. Draw the radius, using a beam compass or trammel points. Mark the centerpoints for the four screw holes on the front face of the footboard. Drill these holes the same way as you did those located on the headboard. Now, bandsaw the footboard's radius, and sand the cut edge. 3 Stack the two side pieces (C) with their ends and edges flush, and join them face-to-face with double-faced tape. On the top piece, lay out the radius, where dimensioned on the Side View of Drawing 2. Saw the radius, and then sand the cut edge. Now, separate the pieces. 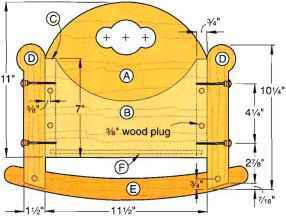 4 Chuck a Va" straight router bit into your table-mounted router, and adjust the fence Va" from the inner edge of the bit. Then, rout a groove -Vs" deep on the inside face of each side piece, where shown on Drawing 1a. 5 Make two photocopies of the patterns for the post on page 126, enlarged to 125 percent. Then, make and assemble a photocopy of the rocker pattern, also enlarged to 125 percent. 6 Adhere two pairs of post blanks face-to-face with double-faced tape. Then, adhere a photocopy of the post pattern to the top of each stack with spray adhesive. Adhere the rocker blanks together in a similar manner, and attach the pattern. Bandsaw just to the waste side of the pattern line, and then sand to the line. Remove and discard the rocker patterns, and then separate the rockers. Don't remove the post patterns yet. 7 Use a square to transfer the locations of the counterbored holes to the cen ter of the outside edge of each post. Next, use a scratch awl to mark the centerpoint of the counterbored hole on the face of each post. Remove the pattern, and hold it in place on the face of the bottom post of each stack, and mark the centerpoint of the counterbored hole. 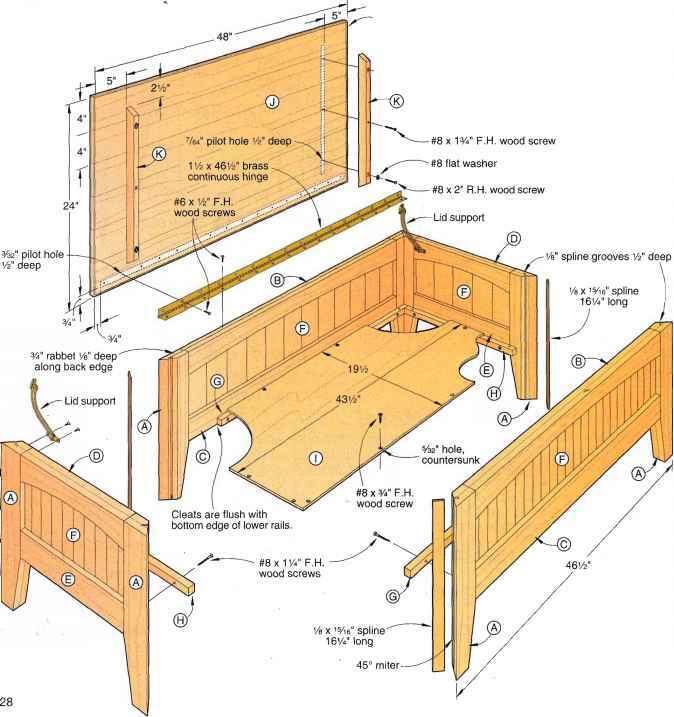 Note: This procedure will correctly place the counterbores on opposite faces of the posts to correspond with the two corner mounting positions of the posts. Drill the counterbores, and then drill the holes centered inside them, as shown on Drawing 1b. Remove and discard the patterns, and separate the posts. Next, finish-sand all parts.